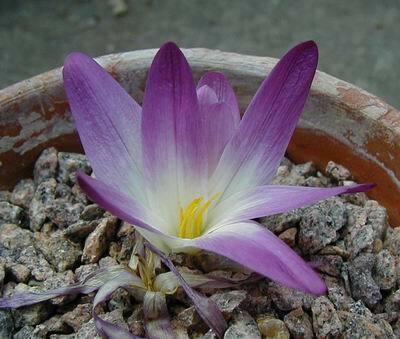 I showed you Colchicum montanum flowering in the garden a few logs ago, here is a view that shows off this lovely dwarf bulb at its best, this time it is flowering in a pot. Just to show how long some of the bulbs will give you flower for here is Rhodohypoxis baurii still flowering in a raised bed. I find that they can be hardy outside here in Aberdeen. Provided they are kept on the dry side they can take a fair degree of frost but show them water in the winter and they are gone. It is also time to check on the narcissus bulbs that I chitted in Log 26. You can see that the latent buds between the leaf scales have already started to form small bulbs. At this stage I like to especially check out the ones that are not forming a bulb and if they are showing any signs of rotting I remove them. It is very unusual for the ones forming bulbs to rot away. 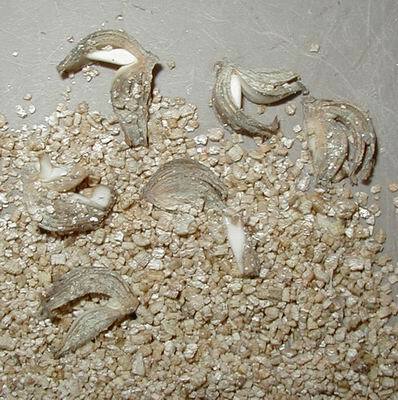 I also assess the moisture level of the vermiculite and if I think it necessary I add a tiny drop or two of water, better too little than too much. Repotting is still on going but we can now say that the end is in sight as the majority have been done. On the left I show a pot of what was this time last year five healthy frit bulbs now you can see that two are healthy and three have just left dried out husks, I call these ghosts. One of the ghosts has two small bulbils attached but the other two are lost and gone. 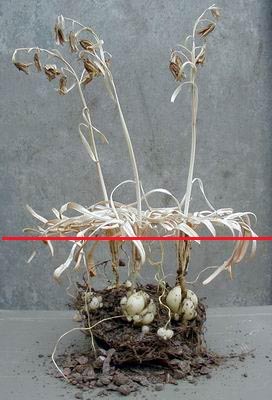 It is difficult to work out the cause of the demise of these bulbs when they share a pot and have had the same treatment as the two survivors. On the right is a nice pot of healthy frits which have grown well note the good root system that they have developed, this is essential if you are to get good bulbs. 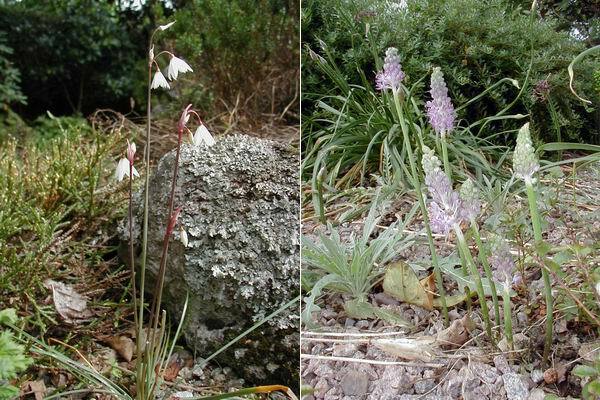 A few logs back I showed a number of Frit camschatensis bulbs mostly from Alaska. 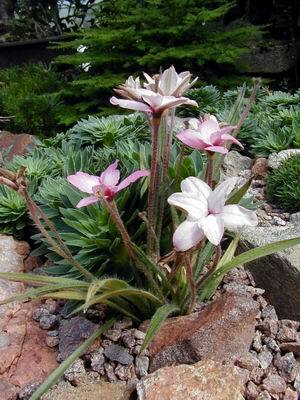 This one is from Siberia and has a very stoloniferous nature. You can see the new white roots which are already coming from the stolon while the yellowish ones are the last years roots which are dying away. 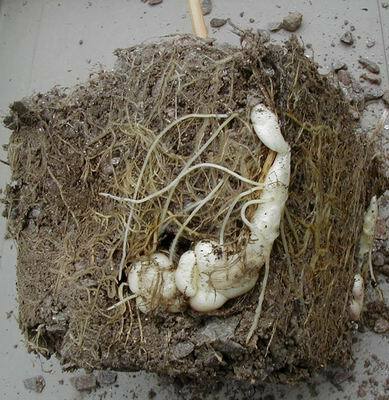 This is a common feature, in cultivation, of 'snow melt' bulbs that grow in a very cold environment where the new roots start to grow before the top growth and the old roots have completely died back. 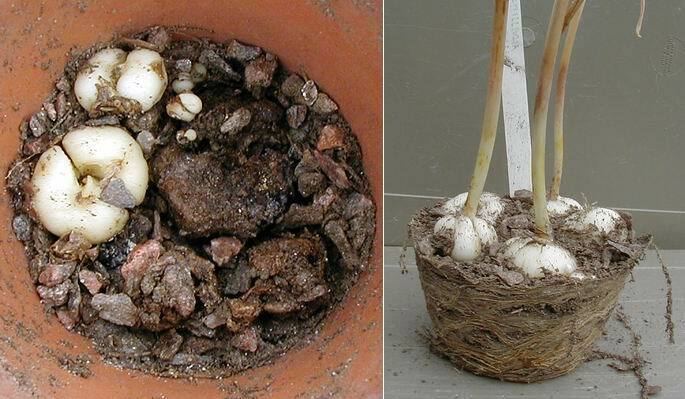 It is very difficult to find the correct time to repot these early rooting bulbs, I do them every second year and I just have to take great care and try not to damage the new roots. 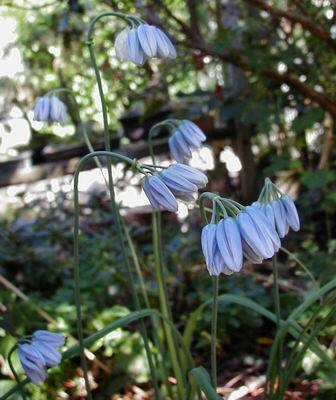 One last frit bulb for this week is a pot of Frit biflora that I carefully tipped out so that I could photograph its growth habit. The red line indicates the level of the gravel and you can see that the leaf stem (petiole) emerges under ground and the leaves themselves radiate on the gravel surface, I cannot think of any other frit that behaves like this, it is the form called 'Martha Roderick'. It was with great sadness that I learned last week of the death of Wayne Roderick. Wayne has done so much to popularise the bulbs of North America and especially those of California. We all owe a great debt to Wayne, he will be sadly missed for his friendship, humour and knowledge. 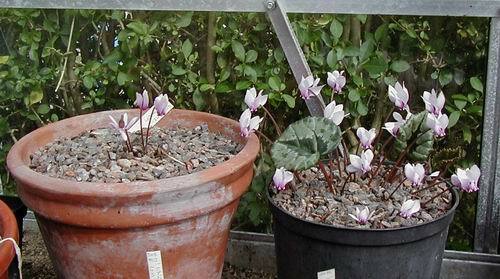 In the glasshouse Cyclamen africanum is coming into flower, a bit too early for my liking as I had hoped to show it at the Discussion Weekend in early October to see if we could beat Sandy Leven's 30+ year old multi-Forrest Medal winning plant whose offspring these are. There have been a number of posts recently in the 'Flowering Now' pages of the Forum showing Alliums. There are some lovely alliums that will extend the flowering season of bulbs in the garden and among my favourites is the beautiful Allium beesianum. Finally for this week I have chosen two delicate dwarf bulbs that announce that Autumn is not far away Leucojum autumnale and Scilla autumnale. While neither would set the heather on fire or stop the traffic in Time Square I think they are charming bulbs for the late summer garden.